This is a four part lesson that will teach students about Native Americans. You will have your students research various Native American tribes to learn each tribe’s geography, homes, dress, food, customs, tools and art. Then, have your students recreate one or more items used by the studied tribe. Students will plan and take part in a presentation teaching the class about their selected tribe. Students will infer how we now use items or customs that originated from Native Americans. Display books, photos, any artifact replicas or any other relevant items related to Native Americans. Compile a list of websites on Native Americans, names of various tribes and resource materials for projects (art supplies, tool supplies such as stones, string, sticks). This lesson will take 4 – 50 minute class periods. 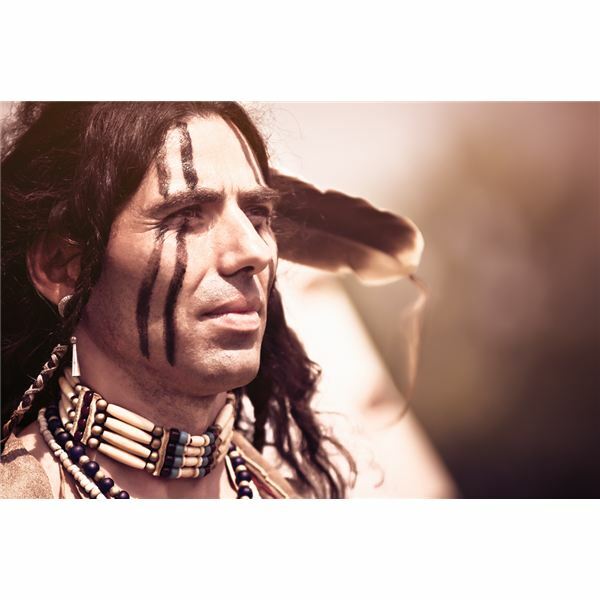 Begin the lesson with an open discussion of Native Americans. Discuss what tribes students have heard of and what they know about each tribe. Discuss common myths about Native Americans and what is fact. Create a list of tribes on a chart. Ask each group to either select books in class or briefly research 2 or 3 tribes they find interesting. Groups should then select one tribe to research further. Tell the groups that they will discover details about their selected tribe for each subject listed. Have the students assign each member in the group a subject to research. Groups will create a written plan of their research methods and assigned items. Finish the lesson by reviewing what the overall plan is, answering questions and reading a book about a Native American tribe, and sharing results from the research with one another. Begin today’s lesson with a review from the last class. Discuss where students should be in the planning stage of the project and see if there are any questions. Rotate through the groups to make sure all students are on task and taking an active role. Break the class into their assigned groups and have them discuss what each student learned in their at home research. Have students create a brief list of what they know (for each topic) and what more they need to learn. Allow the class 15-20 minutes to continue research utilizing books, magazines, and computers. Have the groups re-gather and discuss with the class what they’ve discovered. Inform the groups that they will be choosing at least one item (dress, art, tool, etc.) to recreate as a group. Ask the groups to discuss, select item. Groups should create a list of what they will need to re-create this item. You should be involved during this process. Make sure plans are simple, emphasizing the simple life of Native Americans. Items should be creative, but manageable to make. Be prepared with ideas for each group (tribe) to make. Using their created lists, have the students assign each member a task to create the selected item. In the next class, the Native American object will be created. Tell the groups that they will be making a presentation on the tribe they have researched, covering each of the subject areas to present a created item to the class. Groups should create a plan for the presentation (oral, photo, etc.) and assign each member an active role. Teacher should rotate and check the written plan. Finish class by discussing what the plans and presentation will be for the next class, answer questions and read a Native American based story. Start by a review of what was accomplished during the last class and review the plans for this class. Ask the groups to gather and discuss progress as per their plan. Rotate through the groups during this time to help solve any problems, check progress and student participation. Using the items that each student provided for their re-created item(s), the groups should make the item. It’s important to provide help during this time and check progress. If plans aren’t working, help to provide solutions and have materials prepared to assist in projects. Once items are completed, groups should discuss their presentations. By this time, each member should be almost completely prepared for the presentation. Groups should be able to tell teacher exactly what they will be doing and provide a time estimate. Each group should have 10 minutes to present. Depending on each group’s progress, they can either continue work on presentation or do a dry run. Teacher will circulate, ask and answer questions and help students as needed. Groups will present their tribes and re-created items. The students viewing the presentations should be asked to make a list for each tribe of what we have ‘borrowed’ from this tribe that we actively use today. Following all group presentations, a discussion of what we have learned and ‘borrowed’ from each tribe begins. Students will use their created lists and brainstorm more. Discuss with the class how tribes were alike and different as well as what we today have in common with Native Americans of the past and present. Display presentations and created items in area for class to see, allow time for students to check out these items.